This Rumble ended on 2005-03-01 00:00:00.0. Sindra looked over the blasted landscape of the Desolation. The dragon spawn was in a terrible mood. Her mistress Malystryx was dead and now she was sitting upon the Peak of Malys just waiting for inevitable. Dragons would come, she knew this. They would eventually vie for power in the Desolation and begin searching for Malystryx’s hidden lairs in the Peak. Sindra would be forced to serve another. But before the dragons arrived they would send their minions. Lesser creatures, humans knights, ogres, gnolls and other pitiful creatures. Sindra would slay them all if they tried to approach. She was working to remain free as long as she could from the tyranny of another dominating dragon. She even had grand illusions of ruling herself. She was certainly powerful enough to challenge any lesser dragon if she included her mates and ogres under her control in the fight. Fighting demons and destroying evil creatures from hell and various other dimensions. 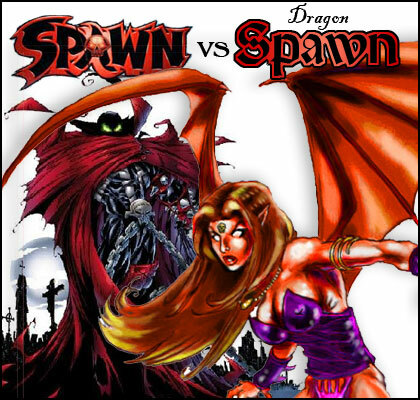 It was just another day for Spawn, this time Hell had unleashed a dimensional shifter that had been slipping from one reality to the next killing innocent people. But Spawn was going to put a stop to that. He had a hold of the beast. His animated chains wrapped around the demon as he struck it again and again with his spike gauntlets. Just when he thought he had the upper hand the creature started a dimensional jump and Spawn disappeared from the back alley along with the creature. Sindra spied a commotion near the edge of the Peak. Two strange creatures struggled with one another. The Dragon Spawn thought she had seen everything, but these creatures were both foreign to her. It wasn’t that surprising however as new creatures appeared in the Desolation all the time. Sindra flew down for a closer look. Spawn continued to battle the demon until it finally expired and melted into a puddle of ectoplasm. Spawn looked around. Evidently he was transported to some strange plane of hell. He stood on the edge of a blasted wasteland at the base of a towering volcano. Irritated that he was going to have to find a way back to Earth he began climbing the Peak. Sindra witnessed the destruction of one of the creatures and spotted the humanoid one climbing the face of the Peak. She didn’t know what master this creature served, but she wasn’t about to grant it access to the Peak. She was going to destroy it before it got that far. The dragon spawn spread he wings and descended upon Spawn to close in for the kill.